Discussion in 'Downhill & Freeride' started by Ridemonkey.com, Jun 13, 2012. 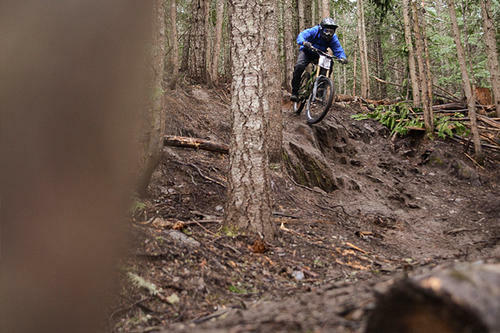 There are few places thatll beat down and test bike parts faster and harder than the Whistler Bike Park. I spent three days riding Shimanos New Saint Group in the park, with conditions ranging from dry and dusty to sopping wet. 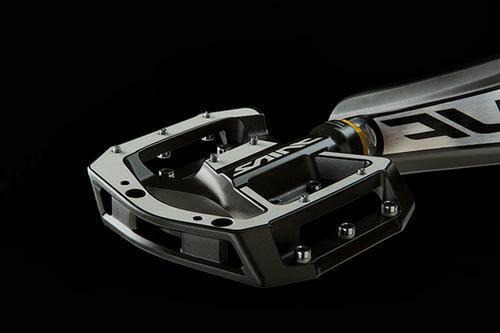 Shimano deviated from its normal three-year release cycle with the newest version of Saint, and made the world wait an extra year while it further tested and refined the group using feedback from one of the fastest men in the world: Aaron Gwin. It seems like this extra time was worth while. Of all the parts in the previous Saint line, my biggest beef was with the brakes. They were too grabby and needed better modulation. In this new version, Shimano claims it has improved modulation and also has increased (over the old version) power by 20 percent, reduced fade by 20 percent and made them run a lot cooler. Helping the brakes stay cool are the Ice Tech rotors and brake pads, ceramic pistons and extra-long banjo fitting. During the three days I was on the Saint brakes, I did found that they really preformed well. They had fantastic modulation and consistency, and didnt require a herculean force to lay down the power. I liked the one-finger ergonomics and overall feel of the shorter, XTR-like levers. Wet-weather performance, though, was what impressed me most. Even when covered in trail grime and soaking wet, the Saints were whisper quiet and as just powerful as when they were dry. The Shimano Saint rear derailleur now features the Shadow Plus system to help eliminate chain slap. On the Turner DHR that I had the Shimano Saint group set up on, the upper length of chain would hit to top of the chainstay every once in a while on extra rough sections of trail, but other than that, and the sounds of the freehub and tires, the bike was dead silent. Shifting was crisp, precise and immediate with the Shadow Plus engaged. 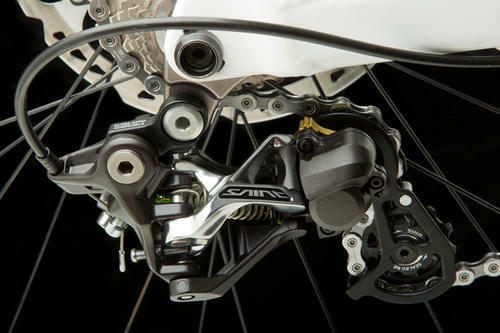 Additionally, the Saint derailleur can be switched between two gearing range settings: 11×28 for downhill use and 11×34 for freeride use. [Note: It is rumored that this derailleur can be run with a 36 cassette, but Shimano does not recommend it]. The shifters in the Shimano Saint group worked well and never skipped a beat. I quite liked the dual release (while pushing the release lever) of the shifters. The ability to dump two gears at once, without thinking, was a nicer experience than I anticipated. Shimano lengthened the shift levers in order to help compensate for the added resistance caused by the Shadow Plus mechanism on the derailleur. 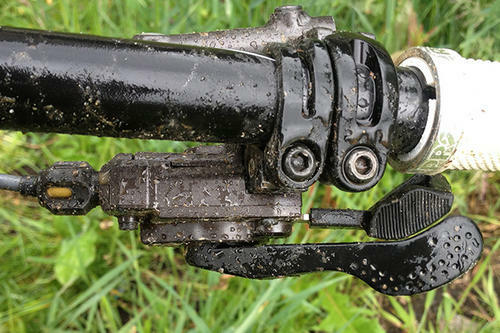 With requests from riders like Matt Hunter, Shimano built a lower profile (than the DX) pedal with pins that thread in from the opposite side of the pedal for easy replacement. My experience on these pedals were nothing but good. I ran both Shimano and Teva shoes and my feet always stayed right were I wanted them on the pedals. 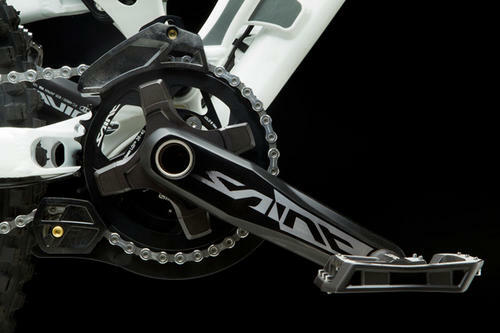 By eliminating the spider, as well as refining the manufacturing process, the Saint cranks dropped about 100 grams, while retaining the same strength (claimed). The Shimano Saint crankset will no longer be offered in a double-ring configuration. On the trail, the cranks felt as solid as ever. 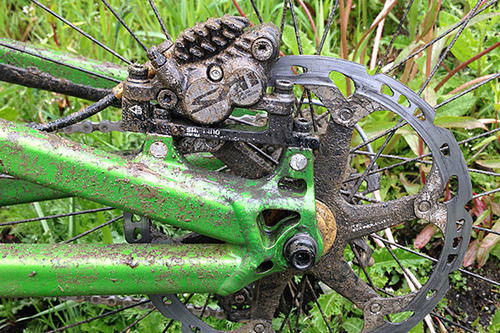 Shimano claims the hubs, like the cranks loose a bit of weight and retain the same strength. I had absolutely zero complaints with the Saint hubs. glad these latest bike articles are free...........i woulnt be happy if i had to pay for this. Apparently these products are 100% perfection! an engineering miracle. So good, will be putting it on my Sunday as soon as it comes out. Shimano <3. didn't have to read it,obviously its amazing.Its made by shimano. Littermag reports that the saint rotors with the fancy fins will be 203mm only (fine), centerlock only (ffs), and $130 msrp (F U SHIMANO). I don't know what they're doing with the saints but the xts this year come rotor free so you can/need to buy any rotor you want. It's not like you NEED saint rotors. I've never heated up a brake to the point of making a difference in my life. A good point actually. Especially where I live, overheating isn't a problem unless you're a knuckle dragging ape. I think perhaps I'm just bitter that bike crap costs so much. 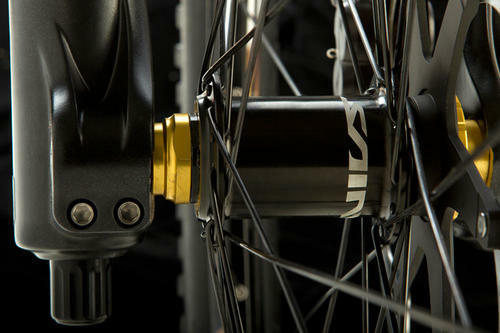 Am I the only one that thinks the m820 saint brakes are priced insanely high? Don't formula the ones end up costing less? Zee seems much more affordable, but for some reason there isn't reach adjustment?! 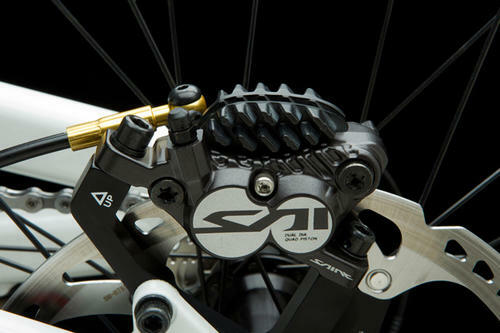 Zee seemes like the ticket for drivetrain, $150 for shifter/derailleur with the shadow+ clutch thinger in short cage. Tempted to make the switch on my trail bike..
Just get the xts, they're like 200 bucks less for a set. I haven't done any extended fall line brake dragging on them but they're easily as strong (they seem a little stronger actually) than my saints from last year. And I have zero complaints with the saints. Hope V2's with Floating Rotors are about $675 or so! I've never heated up a brake to the point of making a difference in my life. then you've never tried riding HOPE brakes! but srsly, 270/side is what I paid for saints 5 years ago when they first came out with 4 pots. I wanted the best, and I got em. The rotor price is mental, but all of shimano's rotor equipment is pretty mental. $25 for an adapter is pretty stupid, honestly, and their rotors are priced in a similar manner. Did they get rid of that silly free play modulation thing they were raving about last season? That was the worst technology ever in the history of brakes. "Yes, this portion of the lever stroke does absolutely nothing, awesome right?" You've never gotten to the bottom of a long steep run and found your brakes aren't as grabby/powerful as they were at the top? Or found that your brakes lose their grabbiness in general over time (esp after a day of riding nothing but steep stuff)? Because if you've ever noticed that, you've noticed what happens when you overheat your brakes. Nobody is boiling fluid, that's true, but the pad/rotor surfaces certainly suffer. It looks like it still has it.. unless they changed it internally it looks pretty much identical to the old setup with the little philips head screw. I had the old Saint brakes, and didn't really like them! The power is great, but the modulation is ****ty, I got used to it after some time, but never really liked the feel of them that much! I actually bought them, because I heard they were more durable than Codes, but actually they were the least durable brakes I ever had! I had to bleed them all the time, and the seals had to be replaced after just 2 month (I didn't even ride a lot)! Maybe I just had bad luck with the pair I got, but combined with the weird modulation it made me change back to some Codes!